A concave PTFE Inside Diameter (ID) seal and a PTFE spring-energized face seal, or an elastomeric O-ring, seated in an insulating laminate and permanently bonded to a high-strength core The VCS-ID (Inside Diameter) Seal introduces an internal, machined PTFE seal at the bore of the existing VCS design platform. The use of a patented interlocking mechanism ensures an extremely tight seal at the bore and resistance to effects from internal pressure or aggressive media. The interlocking mechanism is intentionally designed to be approximately .100” larger than the pipe ID. During installation/loading, the interlocking mechanism will compress to a final state that is slightly larger than the pipe ID. This reduces cavitation in the piping, reduces flange erosion and helps prevent microbiologically induced corrosion (MIC), while not affecting any line pigging operations. Additionally, the PTFE interlocking mechanism creates a longer effective isolating distance than the standard platform. By spanning the VCS platform from end to end, the VCS-ID has a much greater electrical isolation in conductive media. 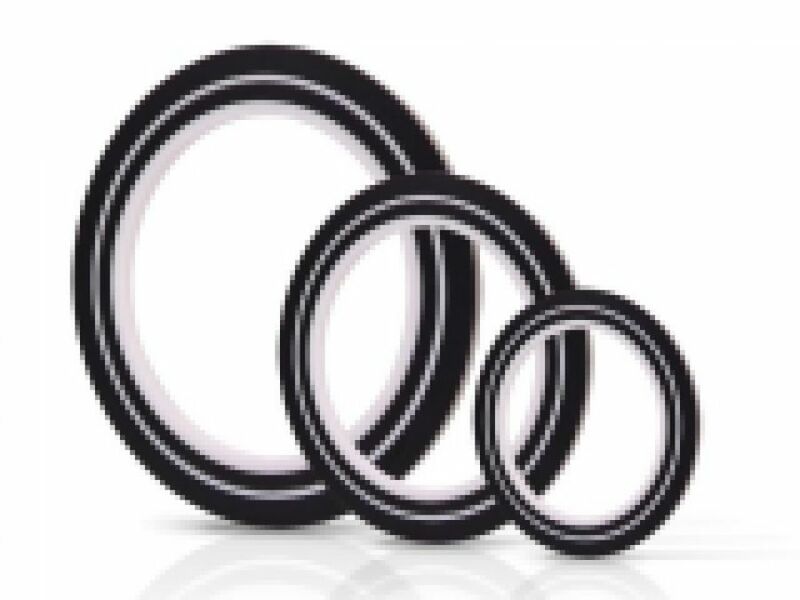 Further, PTFE is not hygroscopic, so it does not have a tendency to absorb water, making it even more attractive as front line defense in electrical isolation. This unique design helps solve problems where hydrotested lines may no longer isolate. The patent pending, (# 61/932,880) interlocking mechanism is “dual locking” to provide a secure seal that won’t dislodge during handling, transport or installation. The “dual locking” feature creates a positive lock in both vertical and radial directions. The interlocking mechanism also eliminates the need for exotic metal gasket core material because it breaks the metal-to-metal path. Obtaining exotic metals can cause long lead times and extra expense that are eliminated with the use of a VCS-ID seal. Another benefit of the VCS-ID seal is that PTFE doesn’t have an affinity for water absorption, installations where electrical isolation testing is performed shortly after hydro-test won’t be corrupted. The VCS-ID does not require any more torque than the standard VCS or VCFS, making installation simple using the same specification charts. Features and Benefits Ideal for applications that would chemically attack GRE Installations where electrical isolation testing is performed shortly after hydro-testing Creates greater gap for greater electrical resistance Great for use in high Chloride applications that could cause Stress Corrosion Cracking with a stainless steel core Eliminates the need for exotic metal cores that match the exotic metal flange material Available with G-11 carrier for 392°F / 200°C Dual Seal nominal pipe size in 6” and up are standard Applications Flange insulation in conjunction with cathodic protection Insulation between dissimilar metals to prevent galvanic corrosion Wellhead isolation from interconnected flow lines Valve connections Christmas Tree connections Pump connections Compressor connections Chemical applications Mating mismatched ring-joint to raised-face flanges (VCS will seal in ring-joint, raised-face and flat face/slip-on flanges) Eliminate fluid trap corrosion between ring-joint (RTJ) flanges where high concentrations of CO2, H2S and other aggressive hydrocarbon media are present Eliminate turbulence and flow-induced erosion between ring-joint (RTJ) flanges Specifications One isolating and sealing gasket, VCS-ID Type “F”, 0.260” thick or .308” thick, 316 stainless steel core retainer laminated on both sides with a G-10 fiber glass reinforced laminate containing a patented, mechanically locking PTFE sealing element. The PTFE element will be concave on the I.D. to induce pressure activation. The PTFE sealing element will be approximately .100” larger than the bore. Sealing element placement shall accommodate either flat, raised or RTJ face flanges. The G-10 retainer shall have a 800 volts/mil dielectric strength and a minimum 65,000 psi compressive strength. Note: Electrical values are based on laboratory conditioned samples in laboratory conditions. Exposure to moisture or elevated temperature will change values.